Sancar is a Turkish-American scientist who won Nobel Prize in Chemistry 2015 for having mapped the fundamental processes at the molecular level and providing knowledge about the molecular causes of several hereditary diseases and about mechanisms behind both cancer development and aging. He will give a seminar to educators and parents about motivation for gifted children. 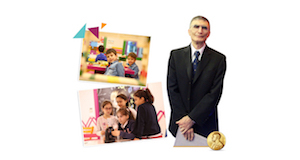 Sancar will also participate in a series of activities with the gifted children. The children will perform a Sema and display their own inventions in robotics, technology, health and science. As part of the Geniuses are included program, which was co-organized by TÜZDER, Yıldız Technical University, Istanbul Technical University, Marmara University and Boğazhisar Education Institutions, international and Turkish academics will hold panel sessions on "Motivation in Gifted Children," "The Unpredictable Development of High Intelligence," "The Things that Are Forgotten About Gifted People" and "Education of Gifted People."